Jason Young: (center of image) My name is Jason Young, and I am from Spokane, Washington. I am a person who stutters, and I have participated in the Successful Stuttering Management Program (SSMP), both as a participant and as an assistant supervisor. This year was my first year participating as a client in the Northwest Center for Fluency Disorders Interprofessional Intensive Stuttering Clinic (NWFCD-IISC). I work as a sous chef for Gonzaga University (go bulldogs! ), and I look forward to basketball season every year. I play guitar, both electric and acoustic, but I favor acoustic. I also work as an actor for the independent film industry, and I especially enjoy the horror genre. I starred as Mr. Dark in the Mr. Dark Web Series, which is as an official selection for The Orpheus Horror-Comedy Film Festival this year. You can see more of my work on YouTube under the channel Jesse Hennessy, or at jjhproductions.com. 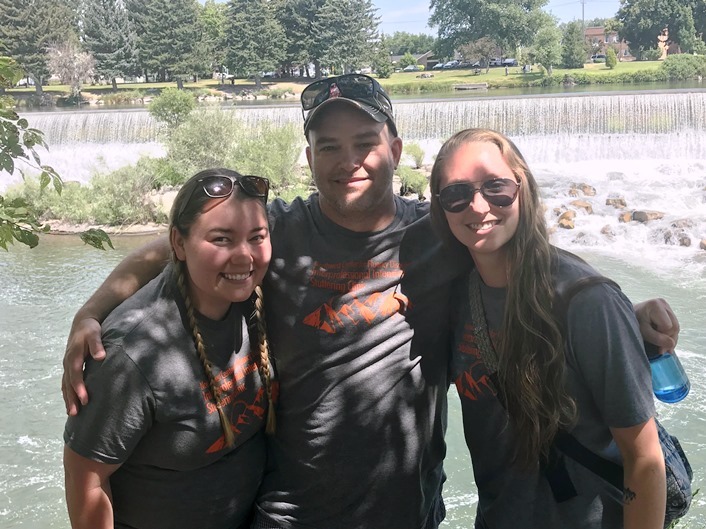 Shelby Pemberton: (right of image) My name is Shelby Pemberton, and I am a second year in the Clinical Psychology Ph.D. program at Idaho State University (ISU). I am originally from a small town called Estill Springs in Tennessee, but I call Nashville home. I received my bachelor’s degree from the University of Tennessee in Knoxville, and my master’s degree from Middle Tennessee State University in Murfreesboro, right outside of Nashville. I worked at Mental Health Cooperative in Nashville while I was in my master’s program and before beginning here at ISU where I worked as a Residential Counselor at a Crisis Stabilization Unit. I have many interests within the realm of psychology but working in more acute settings with individuals with trauma history, and those in crises, such as those with suicidality, addiction, or psychosis has been my passion. However, I love new opportunities to push myself both personally and professionally. Kristin Stiles: (left of image) Hello everyone, I’m Kristin Stiles, and I am in my second (and last!!) year of the master’s program for Speech-Language Pathology at Idaho State University. I moved to this snowy wasteland we call Idaho to complete my degree, and I miss the sunny skies and palm trees of my home in Southern California every day. I received from bachelor’s degree from Brigham Young University in Communication Disorders with minors in editing and Russian. I’m currently working in the neuroscience lab at ISU as an employee and thesis candidate with Dr. Dan Hudock, an associate professor at ISU and the director of the NWFCD-IISC. I aspire to complete a Ph.D. program in the (far) future and continue to work in research and potentially academia. This past summer I participated as a clinician in the Northwest Center for Fluency Disorders Interprofessional Intensive Stuttering Clinic (NWCFD-IISC) at Idaho State University. From my perspective, the theme of “speak your mind” encompasses my entire experience with the NWCFD-IISC, and in keeping with this theme, I will honestly and openly “speak my mind” about my experience. I was one of two clinical psychology students participating in the NWCFD-IISC, and we were the first two students from our department to participate in the clinic as clinicians. It had been recommended that I apply, but I honestly did not understand why or what I would even do within the clinic. Somehow, I was selected to be one of the two students to participate. I remember sitting in training asking myself what I was even doing there, because I knew next to nothing about stuttering, or how to work with an SLP, and absolutely nothing about how to help a person who stutters. Most of my clinical experience comes from working with those with suicidality, psychosis, and generally those in immediate crisis. This appeared to be everything but what I was used to. On top of my anxiety and fear, the clinic required vulnerability and openness to an extent that I was extremely uncomfortable with. The combination of my experiences, emotions, and my own insecurities made me feel like a cat being thrown into water. The NWCFD-IISC had the clinicians pseudo-stutter, and everything was going great while we were in the community practicing. Right before we met with our supervisors to discuss our experiences, I said, “Let me try one more.” Then I walked into the massage clinic. I walked in and asked how much a massage was with my pseudo-stutter, and the lady began laughing. She looked me in the eyes and laughed. She walked past me and asked my partner, Kristin, “Do you talk?” My heart sank. I decided to try one more time and again asked how much a massage was. She once again laughed and pointed to a sign with the prices and walked away from me. I was able to get out a “thank you”, and we left. I stood outside the massage clinic trying not to cry, because I was with my partner and another team. I felt a combination of emotions, but I was downright angry. I was not angry at her, strangely, but at myself. I had told myself that I would stand up and “speak my mind,” yet I said thank you. Seriously, thank you? My mind was racing. I am the person to speak my mind in those situations, but I didn’t. What just happened to me? Who was I? I felt lost within myself. Jason, our client, and all the other clients arrived a few days later. I remember sitting in our meeting room with all of the supervisors, clinicians, and clients when Dr. Hudock, one of the program coordinators, asked us to discuss our experiences pseudo-stuttering and made eye contact with me. I froze. I was struggling with my identity, and I have always struggled with vulnerability, and here I was with this experience that needed to be shared. I managed to raise my hand, and I immediately felt my anxiety, fear, sadness, and anger all creep in. Once it started coming, I couldn’t stop it. I didn’t end up just telling my experience; I shared my feelings and even began to cry (which is very unusual for me). I immediately regretted sharing. I felt as if I had done something wrong and as if I wasn’t good enough, a personal feeling that I have always known but truly realized how much it affected me during the clinic. I did not feel good enough for Jason, either. Being in that place of vulnerability was excruciating, but I was surprised to learn that I was not alone. The unique connection of my team helped Jason and Kristin to recognize what I was experiencing during the process of sharing my story, and they made it clear that they weren’t going to let me stay in that dark place without their company. They supported me and talked through my insecurities. Jason validated me and appeared so thankful that I had shared. I thought this clinic was to help Jason speak his mind, but it was also so much more. For me, this clinic allowed me to watch Jason find his own voice and authenticity, but it also allowed me to find my own voice as well. I often dealt with feelings of inadequacy (both perceived and real) while working at the NWCFD-IISC this summer. I was fortunate to have many positive experiences in the community while pseudo stuttering. People were mostly kind, supportive, and generally encouraging. People did finish my sentences, and some looked visibly uncomfortable when I spoke to them, especially when I had pseudo blocks that lasted more than a couple seconds. I didn’t enjoy these situations, but I more or less maintained “perspective”. This was about education and empathy, and these experiences certainly provided me that. However, perspective all but fled the scene when I stepped into a candy shop. We had had some really good conversations in the community that day, and I was finally getting the hang of the mental acrobatics that stuttering techniques require. I was hoping to finish off our trip to Jackson with a caramel apple. I approached the cashier and asked her for a caramel apple that was pre-sliced. I was shocked when she did a spot-on imitation of my pseudo stuttering (techniques included!) and started laughing at me while others joined in. I blushed. My first instinct was to run. I was at the front of line, and it would have been easy for me to sprint out the door, no questions asked. I could feel my face heating up and employees and other customers staring at me as I asked her the same question, still stuttering, just in a much quieter voice. I got my caramel apple, but as I walked out of the shop, I felt ashamed. Here was an excellent opportunity to provide education and self-advocate, but I failed. As I saw my team members, I thought about keeping it to myself. I didn’t want them to know about how I’d messed up, and since no one from the clinic saw it happen, it would be easy to pretend that it didn’t. But as I looked into the faces of Shelby and Jason and thought about everything they were putting on the line for our team, the words tumbled out of my mouth. They offered a lot of helpful suggestions, as did other people from the clinic, but I said no to everything. I didn’t think that anything would change, and I didn’t think that anyone should do something for me that I should have done myself. I wasn’t able in that moment to self-advocate, but Shelby was. She returned later to that same candy shop and politely but firmly asked that cashier if she knew what stuttering was and gave her an explanation. We can all take a collective sigh of relief in knowing that there is one less person in the world who will make fun of someone for stuttering. Regardless, I still really struggled. I should have educated her, I shouldn’t have told anyone what happened, I shouldn’t have let that affect me, and a million other variations of that same theme broadcasted through my head. I was worried that I was a coward, that I was weak. I wished that I were someone else who was better. Looking back on that experience, I have since realized that the self-judgement was unnecessary. That cashier was in the wrong in that situation, not me. My reaction was normal. Sometimes being brave is saying, “Hi, my name is , and I stutter.” Sometimes being brave is getting through just one more sentence and asking for an apple when everything around you tells you that you can’t. Sometimes being strong is doing things for yourself. Sometimes being strong is accepting help. One of the most enlightening things Jason shared was how he realized that while he didn’t choose to stutter, he still had the power to choose to work on his speech and accept that there would be hard work involved. Speaking your mind is empowering, but it’s hard. It’s hard, and if you stutter, it’s hard every day. But ultimately, there really is no “wrong” way to speak, and the perceptions of other people (and sometimes, our own painful perceptions of ourselves) don’t change that. I’ve participated in similar intensive clinics before, but I have never participated in a stuttering clinic with the counseling piece. I really connected with the counseling piece. During a group counseling session, we learned about values and learned about which values were most important to us. We copied down our ten most important values, and some of those values for me included trust, authenticity, honesty, compassion, and love. We talked about things that had happened that day, and Shelby helped me to identify when I was connecting with each of these values. My team helped me realize that when I use circumlocution to disguise my stutter, I am not saying what I want to say. Saying what I want to say is important to me, but sometimes I feel like someone not knowing that I stutter is a victory. It’s easier to feel safe and in control than to stutter. But I came to the clinic ready to do work, and Shelby and Kristin were right there with me. I think all of us encountered some challenges along the way. The NWFCD-IISC put me in real life situations that made it pretty much impossible for me not to stutter. We did have sessions where we were in a room together talking about managing my stutter or processing my experiences, but I especially enjoyed getting out and around and having some organic conversations. I think that’s all part of the process—creating some new experiences with stuttering while also reflecting on some of the prior ones. It’s important to me to get to a point where it’s just natural. I’m not thinking about it so much—I’m just talking to people. I think that’s what fluent people feel like. I don’t know. I know fluent people think about what they’re saying, but they don’t have to think as much about how they say it. One of my favorite moments at stuttering camp this year was the challenge course. The challenge course includes two parts: a climbing course up a fifty-foot Alpine Tower and a big swing “by choice”. It wasn’t hard to see the obvious metaphor. For the Alpine tower, we were put in groups of four. One person climbed while the other three stayed on the ground to help the climber up and offer moral support. I was pretty sore at the end of the day, but I made it to the top! The big swing involved about ten people working together to pull someone up in the air on a swing to the top of the tower. Whoever was on the swing was able to let themselves go after saying something either out loud or in their head that they wanted to let go of. I yelled, “perfection!” and took a (literal) leap of faith. Towards the end of our time together, everybody was feeling really comfortable with each other. Everybody was having fun with everybody. It was kind of a bit of a family dynamic. That was another one of my favorites. I’ve participated in intensive stuttering clinics before, and I have a lot of experience managing my stutter. Sometimes I just wanted to open up my head and give my knowledge to the other people who weren’t as far along in their journeys. But I know that everybody got out of it exactly what they needed. I absolutely love all of this. The part that stuck with me most though, was the last part of Kristin’s experience. It was encouraging for all people, not only those who stutter. So often we get down on ourselves for not doing something right, but it is important to remember what we have done, how brave we’ve been, how we’ve endured, and how we’ve grown. Overall, great insight that needs to be shared with the world! Thank you for your insightful comment. Yes, I was often surprised with the personal growth that not only Jason experienced, but Shelby and I experienced as well. Working with someone who stutters has taught me so much about stuttering, but it also taught me so much about life. I continue to feel very privileged to have worked with both Jason and Shelby. I hope more SLPs (and other professionals) will have the opportunity to connect with people who stutter in a way that is meaningful to both parties. As a pws myself, I’ve always had a hard time doing voluntary stuttering. “I already stutter, why stutter even more.” Today I know better and understand why this is an important exercise. I’m very pleased that you guys not only tried it, but also shared your emotions. I hope you can use this experience to also try and get the people around your clients to try it, to get a better understanding. I wish more professionals, but also family, friends, teachers etc would walk in our shoes, if only for one hour, to experience the feelings within themselves when stuttering, some people “helping” and other people laughing and mocking. Thanks so much for sharing. Happy ISAD and keep them talking. Hi Anita! Happy ISAD to you too! Thank you for your comment. I appreciate your sharing your perspective on pseudo stuttering and thoughts on our article. Jason did not love when we first used pseudo stuttering in our sessions, either. He ended up preferring it to a lot of things he had tried in the past after some time with it! We have had several clients from our clinic who have gone on to ask family members and friends to pseudo stutter with them. Honestly, the empathy gained from our pseudo stuttering experiences was the most valuable part of the clinic. Learning about acceptance and commitment therapy and techniques was valuable as well, of course, but pseudo stuttering was life changing. Wow to all of you! This was an incredible piece, and so honest from each of you. This really resonated with me because when I did a short stint in therapy (that was unsuccessful, for me, it did not come close to what I needed) I found it fascinating that my graduate student clinicians would ask me to do things they themselves were obviously not comfortable doing. They too asked me to go out in the community and do voluntary stuttering and they would follow me around and “watch” how I’d react to reactions I might get. I honestly thought that was the most ridiculous thing. I thought that they should do it too – with me, and experience just for a brief moment, what it felt like to stutter, be vulnerable on purpose and deal with reactions, some fine, some not so fine. They were quite reluctant but I really pushed for them to do it. They did and shared back how uncomfortable and awkward it felt. I remember clearly the time I had 2 clinicians and we all went across the street and visited a movie theater, drug store and grocery store. They did the pseudo-stuttering but reported/shared back to me how uncomfortable it was for them because they felt like it was “making fun of me,” and just make them so self conscious. I assured them it was not making fun of me and asked them to try and describe why they felt so self conscious. They said it felt uncomfortable to speak “like that” and see people’s reactions change instantly. I reminded them that was the whole purpose, to feel for just moments what it feels like to be so “out there” and vulnerable and feeling like we have no control. At least they were honest about not liking doing it. I’ve always felt that a therapist should never ask anything of a client that they won’t do themselves. Since I left therapy, in 2009, I’ve spoken to lots of SLP classes and read lots of stuff that seems to point out this fear of pseudo stuttering among SLPs is common. At times, I felt like I was teaching the therapists more than they were teaching me, because I had finally found my voice and was trying to self-advocate. I later wrote a paper for an earlier ISAD conference called “Things I Learned In Therapy” that I think is still relevant today. Thanks again for the great honest insights, all of you. I am so glad that our experiences resonated with you. It was very important to Kristin and I to push ourselves to do and experience everything we asked Jason to do. I felt that it was very important that I attempted to experience what he did. I believe that Kristin and I were able to process his experiences in the moment on a deeper level when we were next to him trying with him. We were taught about the iceberg analogy in training but I could not quite wrap my head around it until my experience in the massage clinic. It became very real for me in that moment and I finally could understand a fraction of what a PWS experiences. My experience helped me understand at a much deeper level than I would have been able to otherwise and I am honestly still learning. Thanks to you and papers such as your “Things I Learned In Therapy,” I am able to learn even more. I would challenge every clinician working with a PWS to pseudo stutter because it will change the process and, as Kristin said in an earlier comment, it is life changing. Thank you so much for your comment. What a great experience! I have heard a great deal about the NWCFD-IISC. Hearing the in depth stories from the clinic help remind me how important event like these are. They provide individuals, both clients and professionals, with experiences that allow them to grow. It sounds like all three of you underwent a great deal of positive growth over the duration. As a future speech and language pathologist, I am finding the importance of learning from my clients and from my therapy as well. There is a great amount that can be learned from activities such as psuedostuttering. I am glad that all three of you were able to benefit from a single activity! Thank you for your comment. We hope that more SLPs and professionals will realize as you have the importance of learning from clients and from therapy. The three of us did experience tremendous personal and professional growth. A significant portion of this growth stemmed from a sense of shared vulnerability in the unique situations the NWCFD-IISC provided. Vulnerability begets connection, and connection is at the heart of lasting change. I have loved reading all of your experiences! I think that there is something in here that everyone is able to relate too. Was it hard to make the decision to create and submit a submission for ISAD? Thank you for your comment! I do not want to speak for the rest of my team but for me personally, yes, it was a very difficult decision. As I touched on in my piece, I struggle with vulnerability and so sharing my experience with others was terrifying. Sitting down and actually writing my experience was not difficult but actually allowing anyone, even my own team and my wife, to read it was a different story. The day that submissions were due I debated rewriting my entire submission to make it more about Jason and I honestly struggled with that choice for a while. It was every person who commented here and otherwise that have made me thankful that I shared what I did. My post was about me but I did not submit it for me. It was in hope for others to learn and understand more of what PWS experiences. As a current student, I could relate when you shared feelings of inadequacy when you were unable to advocate for your client. I was recently at a loss for words when I was confronted about a client and I beat myself up for not having the right words to say. I appreciate your vulnerability and openness when sharing your experience about this. I would love to learn more about the counseling aspect of treating clients because it seems as though counseling is a key piece of self-advocacy. To Shelby and Kirstin – I am currently a second year SLP student. I will be participating in pseudo-stuttering for a class I am in in the next few weeks. How did your experience with the NWFCD-IISC and pseudo-stuttering impact the way you approach therapy with people who stutter? Thanks for your comment and for participating in ISAD with us! I appreciate your insightful question. I don’t think the decision to create a submission for ISAD was hard one, but the decision to submit and then let other people read it was difficult and continues to be difficult. I actually deleted and re-wrote my entire piece after I finished my original draft because I struggled to feel like I could contribute something that adequately expressed my thoughts and experiences and was also somehow meaningful. The ISAD experience has been like a microcosm of NWCFD-IISC. The NWCFD-IISC experience was incredible, but I often felt uncomfortably transparent and vulnerable. I remember the first day that I was assigned as Shelby’s partner. I was excited because I already liked her a lot as a person, but I was also intimidated. She was further along in her education, was really put together, and was just so charming and likable in comparison to my awkward/shy/grouchy self that it was overwhelming. In addition, she was able to see things about me right away that I would have preferred to keep hidden and had kept hidden for a long time. Clinical psychs. They’ll get you. Then Jason came. Talk about one of the most authentic, well-adjusted people ever. I know he would argue with me, but not only was he advanced in his journey with stuttering, he was also a personal success. Jason was wise, kind, thoughtful–the perfect mentor. Jason already knew just about everything regarding techniques. He was substantially more knowledgeable than I was. It was difficult for me to accept that I had so little to offer and so much more to learn. It seemed like it should be the opposite. I remember a session we had immediately following a big group discussion in which I had had a complete breakdown in front of everyone. I was being extra clinical in that moment (such was my coping mechanism), going through some data, asking Jason questions, etc. Then Jason stopped the session and said, “I’m hearing the words that are coming out of your mouth, but I can’t stop thinking: are you ok?” I wasn’t on the same level as everyone else, but I was still part of the team. I have tried to maintain this outward image of myself as someone who is aloof, strong, never needs/accepts help, etc. I hoped that image would be as much of the opposite of vulnerable as I could get. I think that’s something a lot of us can relate to. I realize that for the people who participated in the NWCFD-IISC with me and for the people who read this paper, that version of myself ceases to exist. That’s scary. But I don’t think I would change it, if given the chance. I’ve been reflecting lately on how people who stutter are vulnerable every time they speak. If you don’t stutter, you might experience some vulnerability when talking with someone of authority or talking about something you’re passionate about, but you’re not vulnerable with your speech in the same way. However, whatever the nature of our speech, we have a lot in common. We all have insecurities, vulnerabilities, imperfections that we want to hide, and sometimes, we spend so much time and effort trying to cover it all up that it eventually consumes our entire lives. There’s always going to be things that I don’t like about myself that other people will see, but I don’t want the fear of being seen to dictate my life and preclude me from the opportunities of the future. While I speak for myself here, I think one of the biggest things that contributed to our success as a team was a willingness to be authentic and vulnerable with each other. Sharing the painful, darker parts of our histories and our present wasn’t easy, but seeing how those could be transformed into the foundations for what I consider to be a beautiful, lifelong friendship continues to amaze and humble me often. So to answer your question: yes. Thank you for sharing! The thing that stood out to me about your experiences is that at times the clinicians felt inadequate to help their client. I think this feeling is more common than people realize. It seems to me that one critical piece to the success of the camp was having a support system. I think that this highlights why it’s so important for both the person who stutters and the clinician to have a support group to strengthen them when things get rough. Thank you, Jason, Shelby, and Kristin for sharing your experience! When I was doing the pseudostuttering assignment for our fluency class, I didn’t experience any horrible events like you guys did. However, I kind of have an idea of what it would be like for me and how I would feel after reading your stories. People can be insensitive and mean, and one of the reasons might due to lack of education and understanding. I really admire your supportiveness and your courage of going out and advocating for PWS and fluency disorder.